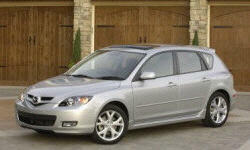 Why the 2007 Mazda Mazda3? The Mazda3 is a very sharp handling car. Its easy to forget that your driving an affordable Japanese compact rather than European sports sedan. The tossible nature plus the virtual absence of body roll make for a very enjoyable drive. Even though I have the "just" the 2.0L engine, I feel the power-band is excellent with plenty of torque to move the car from low speeds even in third gear. And the five speed manual gearbox is among the best in class. I also like the way it sounds. My Mazda 3 is the sedan version. I think in many ways it emulates the E46 BMW 3 Series. Considering the Mazda 3 is probably in its last year or so in its current form makes it even more impressive as the competition looks pretty frumpy. Timeless looks! I get around 28 city/ 34 highway MPG which is a lot better then my pig of a Nissan Maxima got! I feel given the overall performance and fun factor found here, the numbers are amazing.